With Spring right around the corner, everyone has warm weather, spring break, and spring cleaning on the mind! With the weather getting warmer and it being a slower time of the year, March is a great time to take some time for yourself! With every new year, January and February are always hectic trying to get back in the swing of things after the holidays and attempting to stick to all those New Year resolutions that we all know aren’t making it past March. Between attempting to stick to a dry January (attempting being the operative word) and dealing with all the New Year madness, January and February often fly by and we find ourselves in the end of March wondering how the heck we got here! Once the new year has slowed down a bit, March is the perfect time to take a second and really make some plans for your year! Take some time for yourself, practice some mindfulness, buy some cute new trendy and boho clothes obvi, and start the year off right! 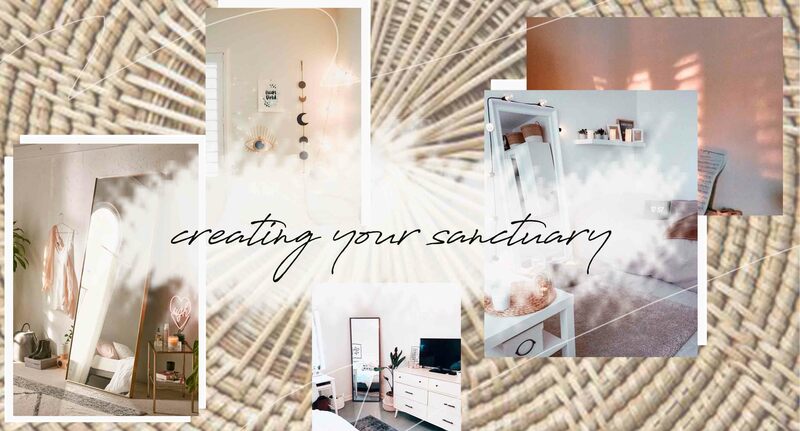 One of our absolute favorite things to do each year is redecorate and in doing so, we always want to make sure we are creating a sanctuary for ourselves! We absolutely love decorating our in store locations in Roanoke, Charlottesville, and Lynchburg and love being able to inspire our customers with our design aesthetic! Lately, we have been getting a lot of questions about how to decorate, what some important pieces to get are, and where to get cool pieces, so we thought we would make a blog for you babes! Our personal design aesthetic currently varies from store to store while maintaining certain bohemian inspired themes! We are all about handmade items, vintage finds, cool art, repurposed furniture, and trendy little touches! We often pair more modern trendy and boho pieces with mid-century modern furniture and even thrift store throw backs that help create the vibe we are looking for! So, what is it that you’re looking for to create your bohemian sanctuary? Stand in your room and look around to take inventory of the vibes you already have! Which items do you truly want to stay, and which items are simply cluttering up your space? Obviously, we need our main seating, a shaggy rug for comfort, and table surface for practical use so we definitely want those pieces to be comfortable, practical, and of course cute! Beyond our basic functional items, the accent pieces are really what can define the room and give it that attitude that compliments your vibe and creates the perfect environment for you! While we personally love a bohemian vibe with jute rugs, macrame, plants, and pops of color, it is important that your sanctuary reflects your vibe! Does your room say contemporary, chic farmhouse, or bohemian free spirit? If your home isn’t reflecting your personality, it’s time for a refreshing update to better express yourself and love your space! In the same way that we can add some sass to an old wardrobe with a new trendy little For Love and Lemons dress or some fab boho chic jewelry, you can bring life back to your living space just adding a few great pieces. We love to think about throw pillows and accent room accessories comparable to accessories and jewelry on an outfit. You can change your entire outfit by adding an awesome pair of trendy earrings or a beautiful bohemian layered necklace and a Brixton hat! In the same way, adding some beautiful throw pillows, unique artwork, or other accent pieces to a room, you can really change the entire look and color scheme and give it that boho vibe! In addition to those pieces, curtains can also really transform a space! Curtains are the luxurious fur coat to your already stunning outfit and they cover a lot of space so make sure you choose a texture and color that you absolutely love! Also, instead of hanging your current rod directly above your window, hang it about six inches or a foot higher for it to really open the space up even more! Oh, and definitely don’t forget those light blocking curtains so you can get that beauty sleep! After you have established your personality and taste throughout your accessories and accent pieces, it is time to step back and take a good look at each wall. When it comes to walls in your home, less is more! There is definitely something to say about a wall that can handle a lot of frames and artwork, but it is a little more difficult to do this well and not make it feel over the top! However, there is no need to fill up every inch of blank space, but don’t let yourself miss a chance to fill that canvas of open opportunity with your favorite photos! A trick we love for pictures that are really near and dear to our heart, is just venturing to our local drug store and having them blow it up in black and white for a vintage bohemian twist on your sweetest memories. One of our absolute favorite décor tools is plants! We absolutely love surrounding ourselves with these beautiful living creatures that are not only visually pleasing, but also clean the air and inspire us to breathe. The best thing about plants is the variety! Whether you are going for a boho vibe or a more classic look, you can find plants that you love and that will match your aesthetic! Just make sure to get ones that are easy to take care of like pathos, philodendrons, and cacti, because we have definitely killed a plant or two in our time… Whatever plant you decide to go with, it will add a beautiful pop of green to your décor and we guarantee it will be a nice touch! On the topic of colors and in case you were wondering, greys are on their way out in the world of interior design! White is still the cleanest look for walls, and complemented by honey wood floors gives a space a crisp fresh yet bohemian vibe. Neutral colors are always a good idea for sofas and furniture because you know it won’t be going out of style anytime soon! However, we do currently love deep pink colors, emerald, and deep blues! As far as materials go, suede and crushed velvets are very posh, and extremely popular textures right now, and we are in love! If you do stick to neutral furniture, you can always utilize your desired accent colors and pieces in other ways!For accent colors you can choose to play it safe by selecting opposite colors on the color wheel, but this is also where you can have fun. The best thing about replacing pillows and other “room jewelry” is that it doesn’t have to break the bank. Our favorite place to go for inspiration is the Bittersweet Boutique Pinterest page! Along with specifically themed boards, Pinterest offers a plethora of DIY ideas for homes and links straight to items that are even occasionally on sale! Sounds easy enough, right?! All in all, décor is all about what you like and what makes your space feel like home! We hope our tips are helpful and we can’t wait to see how you decorate your beautiful space!